Kep’s sunsets are legendary, and it’s also known for its seafood and for the lush mystery of the Kep National Park, which stretches along this beautiful peninsula. Historically, Kep has been synonymous with luxury and exclusivity, but some of that reputation has crumbled, like the overgrown shells of the modernist mansions evacuated under the Khmer Rouge, and now the boutique villas and hotels, which are some of the best places to stay in Kep, welcome everyone. Kep doesn’t really have a town centre, or a long stretch of sand - but some of the best places to stay in Kep do have access to their own private scraps of beach. So this isn’t your classic seaside destination. But it’s perfect if you enjoy hiking, uncovering interesting historical facts and eating well. Kep National Park is the main place to hike, or mountain bike if you prefer. It’s a thick forest run through with trails leading to ruined wats, pagodas, lookouts and up hills and mountains. Kep also has a butterfly farm, several nice wats and temples and some memorable statues. If you’re looking for a sandy beach and don’t mind things rustic, then Rabbit Island is worth a visit, it’s a 30 minute boat crossing, then long stretches of peach sand you’ll be sharing with chickens, crows and various flotsam. Our pick of the best places to stay in Kep provide excellent bases whether you're here to lounge on the beach or explore further afield. The Veranda Natural Resort is a collection of charming Khmer style bungalows, but with modern interiors and private terraces. The spa offers traditional Cambodian treatments, and there’s a restaurant serving both Western and Asian meals. There’s a choice of pools plus a ‘Happy Hut’ for kids. The Samanea Beach Resort offers a collection of 12 modern, beachside villas with light, airy rooms, modern bathrooms and quirky design features. 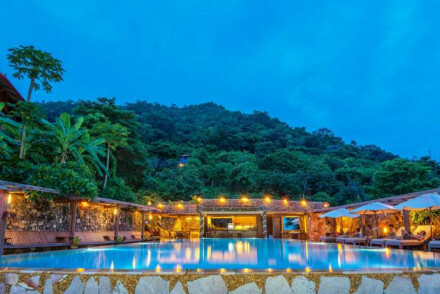 They also have room for dining and relaxing, plus lush gardens and a private beach. For a seriously stylish and luxurious stay, book a room at Knai Bang Chatt. Here you'll find sleek interiors, a roof terrace with a view and simply stunning infinity pool. Not to mention the delicious food! 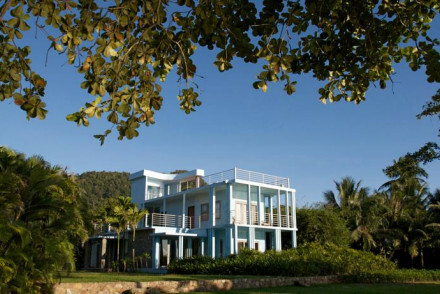 Still not sure which is the best place to stay in Kep for you? Browse through our list of all the best places to stay in Kep, expand your search to include all our Cambodia recommendations, or contact one of our friendly Gurus for advice. 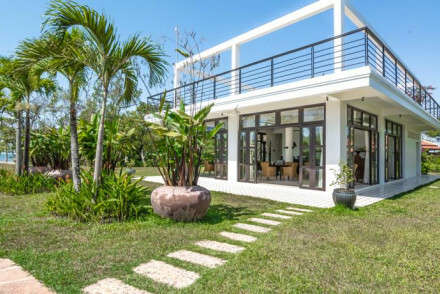 Comprised of wooden Khmer style bungalows with modern interiors, exposed stonework and private terraces. There is a spa offering traditional Cambodian treatments and a restaurant serving Asian and Western dishes. A choice of pools and bars for adults and 'The Happy Hut' for the little ones. Families - Private villas, plenty of pools and a great kids club make this property great for the whole family. Great walks - There are some excellent walking trails along the Bokor Hills and Bokor National Park. Local markets - Crab Market is an enjoyable visit: they are what Kep is known for! Sailing - Take a boat out to Koh Tonsay (Rabbit Island). A collection of modern villas, ideal for families, with a private beachside location. Light and airy rooms feature exposed brickwork, billowing four posters, modern bathrooms and ornamental design quirks. They include lounging and dining areas. Plus lush gardens and a private beach. Divine. Families - Private villas and a whole host of activities: ideal for all ages. Cooking classes - The head chef will be glad to teach you some of the secrets of Khmer cuisine. Great walks - Along your own private stretch of beach including its own jetty. Local markets - The Crab Market is a fun visit. Adhering to the philosophical ideas of Wabi-Sabi, this hotel delights in simplicity. Earthy tones and clean lines define its design-driven aesthetic, but there’s nothing understated about the sensational crimson sunsets that light up the sky. Sink into the pool-side sofas and let the world pass by. City Style - Stunning Vervoordt style interiors this is an impressively chic getaway. Beach Life - Overlooking the Chhak Kep Bay with its own private beach area. Diving - There are plenty of reputable dive operators organising daily trips. Fishing - Head out with the local mariners and catch yourself a fish supper!